My earliest memory of Cow Parade is from 1999 in Chicago. I'd moved there for a summer to do an internship at the Brookfield Zoo (back in my biology days, and pre-digital camera days, I otherwise would've posted a pic of a Chicago cow). It was my first trip to Chicago, as well as the first time I tried living on my own, and the first time I'd done any extensive exploration of a city on my own. The fiberglass cow sculptures, decorated and painted by local artists, stand out in my memory. They were scattered around the city, and there was an easter egg-like surprise to come across one. Since then, I've seen fiberglass angels in LA and fiberglass horses (think: racing)in Hong Kong. And by chance, while internet browsing, I came across the next city to boast fiberglass creatures - San Diego! Applications for a cow design are due by Sept 1, with rolling admissions. You'd think I'd be tired of marine themed art by now. 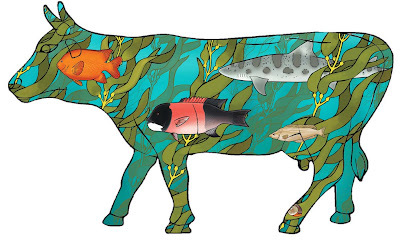 But I couldn't resist applying the kelp forest design to a cow. If I won a cow, the design would be painted on, not wrapped a la van method. It would be quite different. I am taking a break (procrastinating) from writing the 100 word artist's statement. I threw in stuff about how SD is inextricably tied to the ocean, kelp forest represents a local marine habitat, etc. Hmm, a tide pool themed cow would be cool too - covered in anemones, barnacles, crabs, hermit crabs, sponges, algae, limpets, snails, tiny fish, hiding octopus... perhaps I should apply to do a tide pool one too?